It’s the end of August so I know all of the parents out there are trying to get into the back to school mode. Just because you may be packing lunches now or your schedule is full, it doesn’t mean you have to eat junk food. As a parent, I’m sure you are doing the best you can to ensure that your kids are eating healthy. All of my kids have a major sweet tooth, they got it from me. If left to their own devices, I’m sure they would eat junk all day. They’re kids, who wouldn’t. So I wanted to make sure that my kids knew the importance of eating healthy foods rather than having to hear tell them, it’s healthy just eat it. Do your children know the basic food groups and what each of the foods that they are eating belong to? This one is an easy group to discuss because we eat tons of fruit and vegetables. We don’t buy a lot prepared foods so everything we eat is prepared from scratch and we eat a lot of fruits for our snacks. We also have a vegetable garden so it’s been fun watching our veggies grow throughout the summer and they love helping me harvest them although they are not big fans of green peppers and tomatoes. We talked about which foods are grain products so your bread, bagels, pasta, tortilla, crackers, muffins, rice, popcorn and cereal. We also talked about which grains were better that whole grain is better than whole wheat which is better than white bread/pasta. This is where you have your chicken, turkey, beef, pork, fish as well as your alternatives such as beans, nuts, eggs, tofu and peanut butter. Here is where you have milk, yogurt, cheese and soy milk. We also discussed junk food and which foods would be considered junk, if they couldn’t fit into the basic food groups, it was likely junk. Some of their favorite treats like Cheetos, chips, chocolate and ice cream. Although some of them are made of milk, we discussed that it was not significant enough to categorize them into those groups. We also had fun pick apart some of our meals. If you had a pizza what group would the sauce, dough, toppings fall into? We discussed that junk food was fine if it was in moderation. 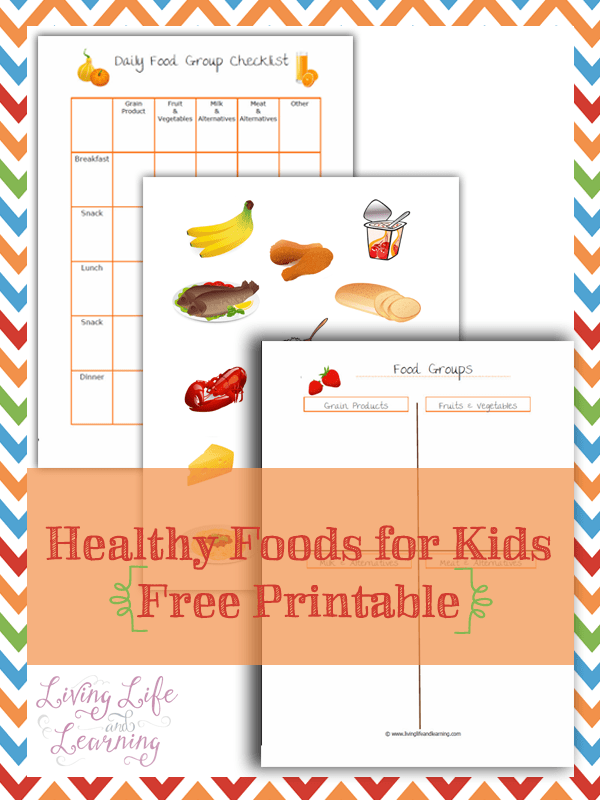 I created this little 3 page printable for your kids to work on as they sort different types of food into the 4 basic food groups. There’s also a daily checklist so your kids can track what they have eaten for the day. This post was sponsored by Horizon Organic. Heading back to school doesn’t mean you have to sacrifice healthy snacks for convenience, fruits and veggies make awesome snacks as well. Don’t forget to follow Horizon Organic on Facebook, Twitter or Pinterest.